Appalachian Power Company (APCo) has spent the past two years ducking its Virginia customers who want the ability to buy solar power from third-party providers. This spring it finally unveiled what it claims will be the answer to their prayers: a bizarre, convoluted “Experimental Rider R.G.P.,” available only to certain larger customers like colleges and universities. Under this proposal, a customer can arrange to have solar panels installed and owned by a third party developer but won’t be allowed to use the electricity or take advantage of net metering, as it would if it owned the system itself. The customer will have to continue buying dirty electricity from APCo, while the solar electricity the customer is also paying for is sold onto the grid, and the customer credited for its value according to a complicated and unfriendly formula. Instead of breaking even or saving money on electricity bills by going solar, the customer will pay substantially more. Understanding what’s at stake here requires a short history lesson. Back in 2011, a solar developer out of Staunton, Virginia, called Secure Futures LLC installed a solar array on a rooftop at Washington & Lee University. The parties used a popular financing approach known as a third-party power purchase agreement (PPA), which can let a customer go solar with no money down by having the developer keep ownership of the solar panels and sell the electricity they produce to the customer. Federal tax rules make PPAs especially important for tax-exempt entities like colleges that can’t use the 30% federal tax credit for renewable energy facilities. When a for-profit solar developer owns a facility, however, it can take the tax credit and pass on the savings to the customer. PPAs appeared to be explicitly authorized under Virginia law, but when Dominion Virginia Power got wind of the arrangement at Washington & Lee it moved quickly to block it, claiming a violation of its monopoly on the sale of electricity within its territory. Dominion’s weak legal position didn’t matter; the mere threat that the utility giant would unleash its army of lawyers was enough to stop the PPA in its tracks. 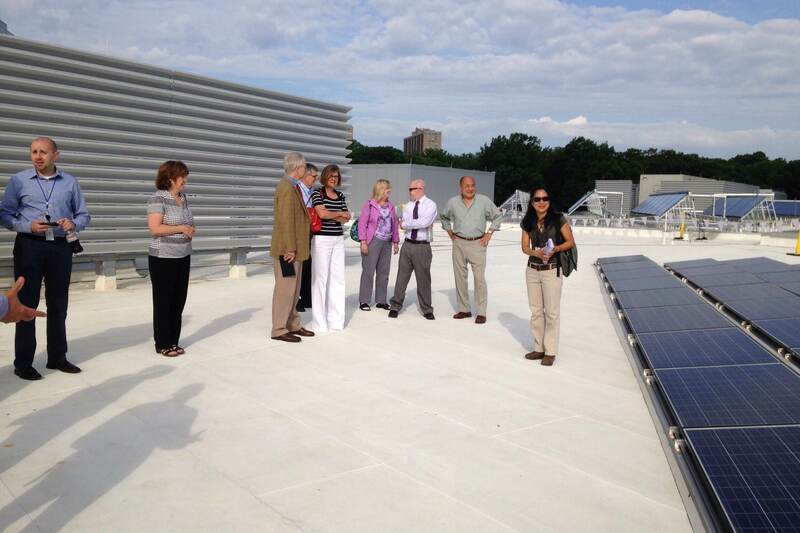 The university completed its solar installation using an alternative, non-PPA approach. Dominion had won the skirmish, but at a price. The utility took such a drubbing in the court of public opinion that it eventually acceded to legislation in 2013 establishing a limited “pilot program” under which not-for-profit entities and some commercial businesses can use PPAs, at least through the end of 2015. Secure Futures has gone on to develop additional solar projects in Virginia under the legislation, including at the University of Richmond and, under a just-announced deal, at six Albermarle County schools. APCo, however, didn’t participate in the pilot program, and it has steadfastly resisted efforts to bring it into the fold, even in the face of mounting criticism. As Belleville pointed out in a Roanoke Times op-ed in March of 2014, the failure to extend the PPA law to residents of APCo territory put southwest Virginia at an economic disadvantage, closing it off to business opportunities that are available elsewhere in the state. Yet utility lobbying successfully defeated legislation this year that would have made PPAs explicitly legal statewide. So southwest Virginia’s state of limbo persists, with many legal experts advising that PPAs are legal there under Virginia law, but most developers and customers unwilling to expose themselves to prolonged and expensive litigation to find out for sure. This state of affairs suits APCo very well. No doubt it calculates that the worst that can happen now is that the SCC rejects its rider and prolongs the state of limbo. Then the utility’s lobbyists will tell legislators it did its best to help customers but was prevented from doing so by that darned SCC. APCo’s actions are those of a rational monopolist facing the threat of competition; it is easier to keep a competitor out of your market than it is to improve your product. But its efforts to throw roadblocks in the way of solar also reflect the suspicion, shared by many American utilities, that distributed solar generation benefits only the customer who installs it, at the expense of the utility and other customers. They believe this justifies them in making solar more expensive, even if it means preventing projects from being developed altogether. This is a textbook example of cutting off your nose to spite your face, given the need for a rapid build-out of distributed solar generation to fight climate change and strengthen grid security. These are not considerations that hold much sway with Virginia’s SCC, however, so let’s confine ourselves to the cost argument. The problem for APCo is that the notion that distributed solar increases costs for other ratepayers is mere conjecture, and neither APCo nor Dominion has offered any hard data to support it. Indeed, the only evidence from Virginia points the other way, according to Secure Futures CEO Tony Smith. Since his company’s skirmish with Dominion, Smith has worked with a municipal utility, Harrisonburg Electric Commission (HEC), to study the financial impacts to the utility of Secure Futures’ first Virginia PPA project, a 104-kilowatt array installed in 2010 at Eastern Mennonite University in Harrisonburg (outside of Dominion territory). Using a net benefit model developed in consultation with HEC management, we find that in the case of the EMU solar installation, the benefits to HEC outweigh the costs . 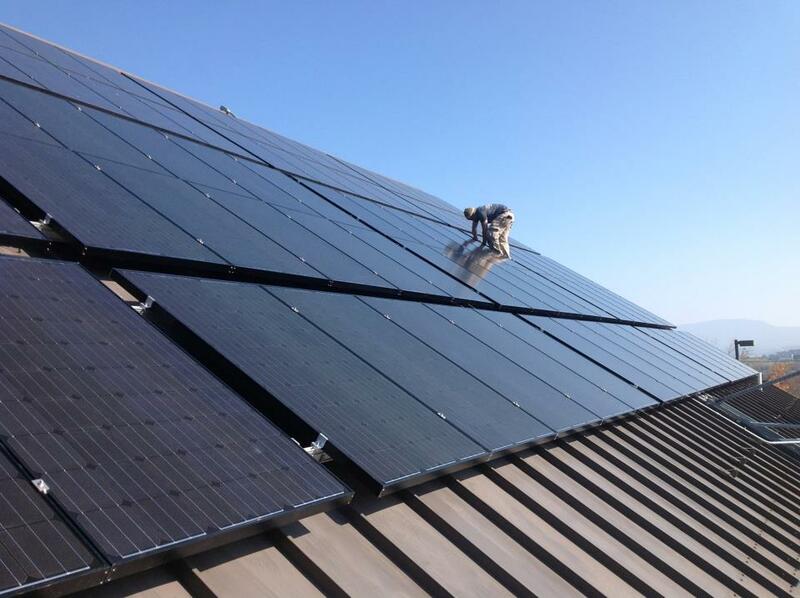 . . Our net benefit results suggest that within HEC territory, solar installed for a commercial customer with demand exceeding 1,000 kW benefits all municipal utility stakeholders, including non-participants. Certainly it would be interesting to repeat the analysis with data from more Virginia projects, including ones in APCo’s territory. But first, those projects have to get built. Right now that isn’t happening due to the PPA limbo. If APCo’s Experimental Rider gets approved—well, the projects still won’t get built, because no one will sign up. Flip a coin: heads APCo wins, tails customers lose. The SCC case is No. PUE-2015-00040. An evidentiary hearing is scheduled for September 29 at the SCC offices in Richmond, Virginia. *Residential customers don’t pay demand charges, making this an unfamiliar concept to many people. Demand charges (KW) are fees over and above the cost of energy usage (kWh) that are assessed according to a customer’s peak power requirements, measured as the highest peak demand in a given 30-minute period during the month. For many institutions, demand charges can exceed the cost of energy usage, and using solar electricity to reduce peak demand is often a compelling reason to look at solar in the first place. Amory Fischer was a high school sophomore in Albermarle County in central Virginia four years ago when he got interested in the idea of using solar panels to provide some of the power used by the local schools. He found a lot of people shared his enthusiasm, but economic and policy hurdles stood in the way. In 2012, a local middle school used federal stimulus money to install solar PV and solar hot water. Unfortunately, schools without grant funding couldn’t afford to follow suit. Although the cost of solar panels had fallen to record low levels, buying and installing them still required a significant upfront capital investment. And as tax-exempt entities, public schools couldn’t take advantage of the 30% federal tax credit available to residents and businesses. Then, in 2013, the Virginia General Assembly passed a law allowing nonprofits and local governments, among others, to buy solar power using a tax-advantaged financing method known as a third party power purchase agreement (PPA). * PPAs can be structured to require no upfront capital from the customer, just payment for the electricity the solar panels produce. Suddenly, for the first time, the economics favored solar for Virginia schools. Amory and fellow students collaborated with Lindsay Snoddy, the school division’s Environmental Compliance Manager, and spent the next year educating teachers, staff, parents and the community about the benefits of solar and the opportunities presented by the new law. Partnering with environmental groups 350 Central Virginia and the Piedmont Group of the Sierra Club, they formed the Solar Schools Initiative and circulated a petition that garnered nearly a thousand signatures in support of putting solar on Albermarle schools. It worked. Once school board members understood that a PPA would let the schools install solar panels at no additional cost premium over regular “brown” power—and indeed, would even save them money—their support was unanimous. The school board issued a Request for Proposals and chose Staunton-based solar developer Secure Futures, LLC to develop the projects. 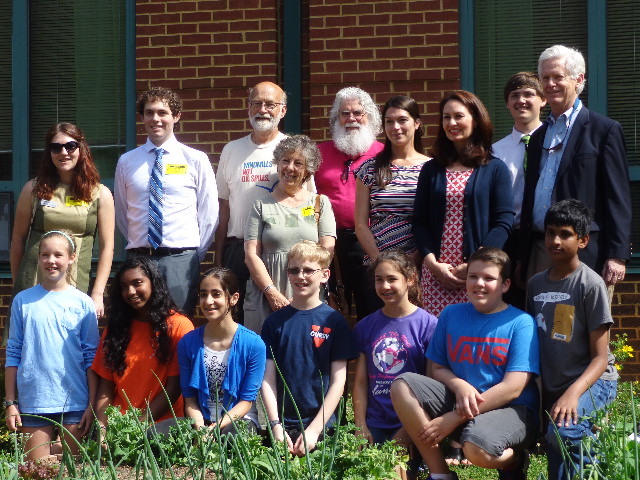 Students and community members gather at Sutherland Middle School in Albemarle County on May 28 to celebrate the student engagement that led to the signing of a contract to put solar on Sutherland and five other schools. Six area schools will have solar panels installed by the end of this year: two high schools, a middle school, and three elementary schools. Together, the installations will total 3,000 solar panels for a combined 1 megawatt (1,000 kW) of capacity, producing about 14% of the electricity used by the schools. Amory Fischer is now a junior at Virginia Tech, where he studies Environmental Policy and Planning. This summer he will be working for Secure Futures and trying to encourage more schools across the Commonwealth to go solar. He will find a promising market, so far largely untapped. A small number of schools elsewhere in Virginia already boast solar panels, but most of them are small systems designed more for their educational value than to make a significant contribution to the school’s power demand. One significant exception is the Center for Energy Efficient Design, an educationally-focused building in Franklin County that “enables students and community members to explore various energy devices and techniques to make intelligent decisions about energy and housing.” It was completed in 2010 and designed to PassivHaus and LEED Platinum standards. In addition to solar panels, two wind turbines help meet the electric demand, and the building includes other energy and water-saving features like a geothermal system, solar hot water and a green roof. The project reflects an impressive commitment from the Franklin County School Board going back to 2004. Net zero is also the goal of advocates in Harrisonburg, who are pushing the city to include solar and other green features on a school building that is currently in the design phase. Bishop Dansby, a member of the Harrisonburg-Rockingham Green Network, says residents collected more than 800 signatures in support of a net zero energy school, but the school board has not told them yet whether it will adopt the recommendation. One encouraging sign: the board has hired Charlottesville-based VMDO Architects, the firm behind Arlington’s Discovery school. Other Virginia localities are decidedly lagging, including ones you’d expect to see in the lead. Affluent, tech-savvy Fairfax County is missing in action on solar schools; advocates point to an insular and uninterested school bureaucracy as the primary barrier. A group of students at Thomas Jefferson High School for Science and Technology hopes to change that with a petition drive aimed at getting the county to act. *Unfortunately, the 2013 PPA law applies only to customers of Dominion Virginia Power as part of a two year “pilot program.” The legality of PPAs elsewhere in Virginia is unclear. However, Secure Futures offers a PPA alternative called a Customer Self-Generation Agreement that offers similar benefits. The company believes is legal in all parts of Virginia. 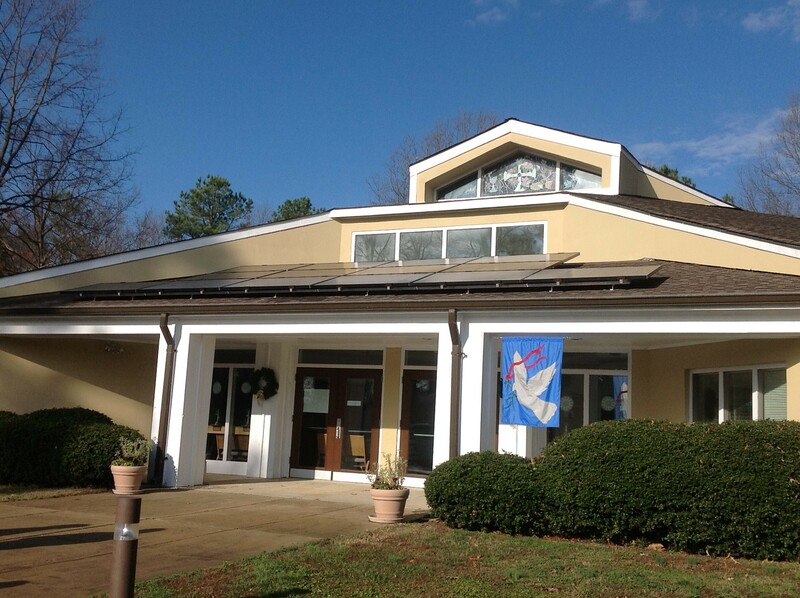 Fourteen solar panels crown the entrance to the First Congregational Christian United Church of Christ in Chesterfield, Virginia. The small array generates 10% or so of the church’s electricity, but the project is notable for a different reason: it was the first solar system installed anywhere under a new kind of contract called a Customer Self-Generation Agreement. The agreement allowed the church go solar with no money down, and without increasing its electricity costs. 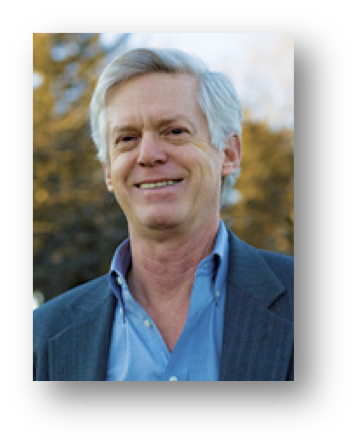 The Customer Self-Generation Agreement (CSGA) is the brainchild of Tony Smith, founder and CEO of Secure Futures LLC, a solar developer based in Staunton, Virginia. Under its agreement with the church, Secure Futures owns the solar panels and reaps the federal tax benefits that make solar affordable. The church gets the electrical output of the system over the twenty-year life of the contract. Neither a lease (which would bar the church from getting the tax benefits) nor a third-party power purchase agreement (which the incumbent utility would have opposed), the CSGA occupies a financing niche all of its own. For Secure Futures, the CSGA was born of necessity. In 2011, the company was blocked from completing a solar array at Washington and Lee University when Dominion Virginia Power sent “cease and desist” letters claiming the parties’ use of a third-party power purchase agreement (PPA) violated the utility’s monopoly on the sale of electricity. Although convinced it had the law on its side, Secure Futures backed down in the face of expensive litigation. The solar installation was only completed by turning the PPA into a lease and losing some of the tax benefits. Tony Smith. Courtesy of Secure Futures. Secure Futures had been building a place for itself in the nonprofit world, appealing especially to colleges and universities that want solar power as part of their sustainability goals. The company’s 104-kW solar array at Eastern Mennonite University in Harrisonburg, Virginia, completed in 2010, was the first PPA in Virginia and, at the time, the largest solar array in the state. But that project was not in Dominion’s territory. For a state like Virginia with few policies to support solar, accessing the federal tax credits is critical to financing a solar project. Tax-exempt entities like municipalities, schools and churches are a natural customer base for solar, but because they cannot use the federal tax credits themselves, they must partner with a tax-paying company that can own the project. Third-party PPAs have been the answer in states that allow them. PPAs also frequently offer a no-money-down option, which has proven a huge market driver in recent years for homes and businesses as well as non-profits. 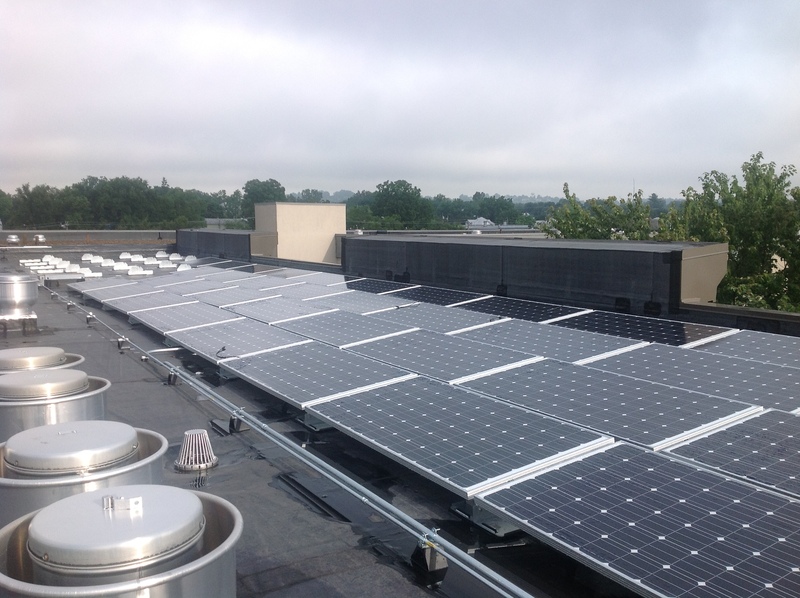 Solar array installed by Secure Futures for the Harrisonburg Redevelopment and Housing Authority using a CSGA. Photo courtesy of Secure Futures. But after the Washington and Lee experience demonstrated both Dominion’s hostility to PPAs and its willingness to use its legal firepower, Tony Smith decided to seek another way through the legal thicket. Working with regulatory lawyer Eric Hurlocker and tax specialists at Hunton and Williams, Secure Futures developed an innovative contract model that could provide the tax benefits of a PPA without running afoul of utility monopoly claims. CSGAs are contracts for solar services but, crucially, don’t involve the sale of electricity. Although Dominion Power eventually relented enough to cooperate on a bill passed in 2013 that allows a small number of PPAs within its territory on a “pilot project” basis, Secure Futures has continued to use the CSGA model in subsequent projects because it offers features that a standard PPA does not. Perhaps more importantly, neither Dominion nor any other utility has signaled opposition to CSGAs. Suddenly, Secure Futures’ niche looks huge. The ability to use CSGAs wherever PPAs would make financial sense opens up new opportunities among non-profits not just in Virginia, but in all of the 28 states where PPAs are currently either illegal or of uncertain status. As Smith notes, no state bars customers from generating electricity for their own use. While Smith is eager to see his company grow, he says his larger goal has always been to open the floodgates for solar projects across the country where they are held back now only by outdated laws and flawed policies. He hopes to license the CSGA approach, ideally to a non-profit that could work with developers across the South to make this contract model widely available. Virginia has always been a hard place to do business for solar companies, so much so that Smith refers to it as a ”dark state.” Knocking down the PPA barrier won’t bring the sunshine in all by itself, but it does create an opening.